of another? Sure! Under certain conditions that is. monitor from the two bad ones? Sure it would! picture tube, and the pinouts of the CRT socket. the CRT will be preserved. How can you tell if the yoke will work with the different monitor chassis? horizontal deflection coil will have a low resistance. Somewhere around 2. 4 ohms is typical for 13" or 19" monitors. 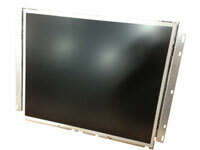 Larger monitors such as 25"
current levels are required to deflect the electron beams. deflection coil for a 25" or 33" CRT may be as low as 9 ohms. deflection coil of the yoke as they vary quite a bit in resistance. it has to be pulled off to allow the yoke to slide off after it. before removing the assembly for the neck of the picture tube. of the glowing CRT neck, so be cautious when you handle it. Mark the position of the existing yoke on the neck of the good CRT. Loosen the yoke clamp and slide it off the neck of the picture tube. hooked up (and if you're lucky) you should have a perfectly good picture. unacceptable you'll have to do it. If the pinouts are the same, the CRT should be electrically equivalent. CRT swap if I have to mess with it to that extent. you'll have another monitor to put out on the route!